The full Moon is a beauty for the eye any time. It is always a difficult close up image because the flat lighting hides details of the lunar surface. Tonight brought poorer transparency but better seeing to skies in Austin. I'm pleased with the final result only 7 hours before the full Moon. 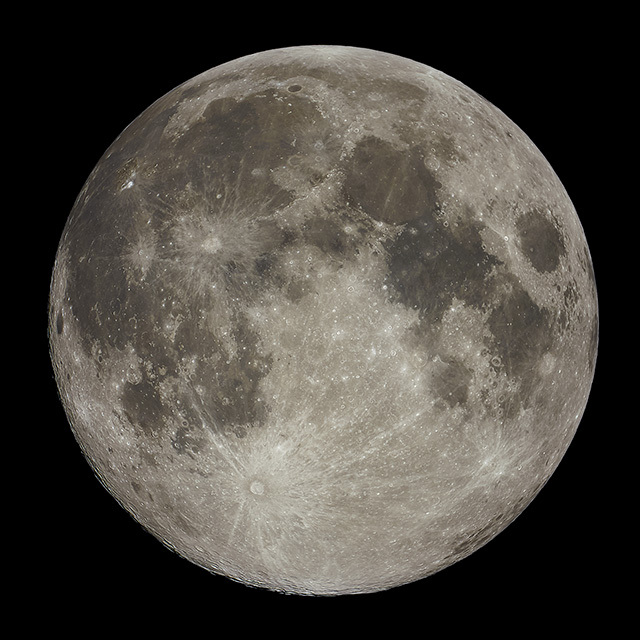 On March 31 we have our second blue Moon of 2018, shown here from Austin, Texas at 2018-03-31 04:08 UT. Taken with a Questar 1350/89mm f/15 telescope with a Sony a6300 camera at prime focus. Images exposed for 1/80 sec at ISO 100. The best 8 of 171 images were stacked in Autostakkert 3, deconvolved in Lynkeos, with final exposure and crop in photoshop.